Once touted as merely a fad, or a blip on the global health radar, exotic fruits and grains have settled into being permanent fixtures in the natural products industry. While old standards like pomegranate and açaí have remained strong, even more unique and exciting ingredients from around the world continue to make their debuts in the American market. Confirming this trend is market research firm Mintel, which predicts cupuaçu (Amazon region) will be the “next big superfruit” this year (1), while Sensient Flavors picks caja fruit (Brazil) and marula (South Africa) as two of its top 10 beverage flavor trends for 2010 (2). Exotics: Rare, but Are They Fair? The health benefits of many exotic fruits, superfruits, and grains are astounding, not to mention the allure of trying something new from a far away land. Chris Herbert, working in sales and education for North American Herb and Spice, Buffalo Grove, IL, says, “The countries and remote regions from where we harvest our ingredients have nutrient-rich soils free of all chemicals, fertilizers and other toxic materials,” which certainly adds to their appeal. However, there still exist ethical concerns about the global reach of Americans’ desires to attain these ingredients and products. And often, companies’ efforts do not go unnoticed by local authorities. For example, says McMullin, Sibu Beauty has put in place contracts with local Tibetan harvesters that have spurred new sources of income and jobs in the region. According to McMullin, the Dalai Lama, who occasionally lives in a monastery overlooking one of Sibu’s major harvesting operations, requested to meet with a Sibu official in September of 2009 to personally thank him for the company’s efforts. In addition to fair trade certification, many companies take things a step further. For example, Zola Açaí created Project Zola, which focuses on building community infrastructure, improving quality of life and protecting the environment with specific and tangible goals in a 100% transparent environment, says Chris Cuvelier, founder and president of the San Francisco, CA-based company. XanGo, too, is teaming up with charitable partner Operation Smile and the Thai government to support a 2010 medical mission to Thailand. Can we have the best of both worlds? 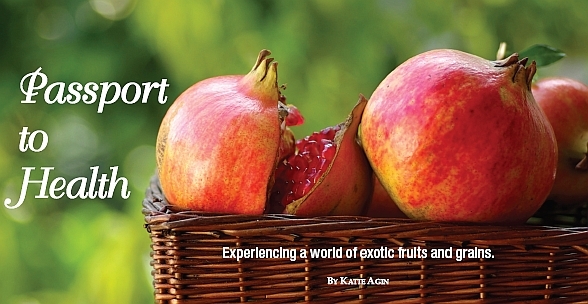 To obtain the health benefits of these exotic fruits, they must travel to us from the far reaches of the globe, which raises other another ethical dilemma—food miles. In a market that is currently favoring sustainability and locally sourced foods, some wonder if they have to choose between the health benefits of these foods and environmentalism. McMullin says, “This is a question we struggle with internally. While there is a huge demand for locally grown products and exotic superfruits, we cannot currently provide both.” At this time, the company is actively setting up a new program to start growing sea buckthorn locally. “It will take years to yield any useable raw material, but we feel it will be well worth the effort eventually as sea buckthorn grows in popularity,” he says. Many companies choose to forgo imports whenever possible and source locally. Jarrow Formulas, for example, uses California pomegranates, says Kaori Shimazaki, Ph.D., technical specialist for the Los Angeles, CA company, rather than importing them from the Middle East, India or China. This is understood overseas as well. Rodrigo Correa, native Brazilian and marketing manager for Açaí Roots, based in San Diego, CA, adds, “We do understand that it is important to local source whenever it is possible, however, since açaí [and other superfruits] demand a very specific environment and climate condition for production, it might not fall in this category.” As of now, says Correa, less than 5% of the açaí palms in Brazil are being used for harvesting the fruit, so the increase in demand has not had a high impact in the actual supply. Wes Crain, vice president of Navitas Naturals, Novato, CA, agrees. He explains it is a “false choice” between environmentalism and choosing to source grains from a distance because recent studies show that certain agricultural regions are simply better suited to produce certain plants; raising them locally creates a greater need for intensive agricultural techniques, and, therefore, is not as “low impact” as importing them from places where they are easy to grow. Plenty of other challenges exist when working with exotic ingredients, but demand is high and companies are willing to do what it takes to deliver. According to Gibbons, suppliers who have multiple certifications and organizational memberships such as ISO, kosher, halal and organic tend to have the fewest problems with ethics, fair trade, transportation, spoilage and international regulations. “These companies reinvest in themselves, their technologies and their quality. They are in stark contrast to the unscrupulous fly-by-night outfits looking to make a quick buck on the latest exotic fruit fad,” he says. In other cases, Gillot says, the political and economic situation may affect the day-to-day operations of a company, for example, transportation. • Freshness. Many superfruits and grains have very high oil content, which make them highly susceptible to rancidity. Also, their precious nutrients can be lost in their journey to the manufacturing plant. For example, Correa says, “Açaí is a very tough product to work with. The entire process is extremely difficult and specific and needs to be done within about 12 hours of the harvesting, since otherwise, the fruit loses most of its nutrients. Therefore, all transportation and storage involved in the frozen pulp needs to be frozen. Herbert adds, “A lot of superfruits/foods have been pasteurized and we know anytime you apply heat to food, vitamins, minerals and antioxidant levels are wasted. We have learned from our forefathers the importance of spices to preserve food, which we use to help preserve our superfood products.” Some of these spices may include rosemary, cinnamon and oregano. An argument presented by the law firm Ullman, Shapiro and Ullman alleges that FDA’s focus on packaging is an attempt to classify more products as conventional foods, and thus reclaim additional regulatory control over them. Steve Kravitz, president of Earth’s Bounty/Matrix Health Products, Vancouver, WA, notes that the manufacturer’s intent and the contents of a product should determine its classification as a beverage or a supplement, not necessarily the shape/size of packaging. For example, whether a product is meant to quench thirst, provide an energy boost or fortify one’s diet, the manufacturer’s intent (including serving size) should be clearly labeled, thus placing responsibility on the consumer to, well, read. The issue becomes part of the larger problem regarding FDA’s opinion-based determination of what constitutes a supplement. Everywhere we look now, we see four bold letters jumping out at us from product labels: ORAC. ORAC, or Oxygen Radical Absorbance Capacity, has become industry’s latest, and very debatably greatest tool for expounding the benefits of a product’s antioxidant capacity. ORAC has certainly garnered a lot of attention lately, but also some strong, varying opinions. Many contend that consumers don’t understand the true meaning of ORAC, seeing it as a marketing tool while others believe it is a step in the right direction for understanding antioxidant values. While some ingredients have extremely high ORAC values, some companies choose to focus on the unique attributes of the fruit in differentiating them from other superfoods. For example, says McMullin, “Sea buckthorn is also high in omega fatty acids, specifically omega-7, which is very rare,” he says. How super is that fruit? Essential fatty acids, amino acids, proteins, phytosterols and carbohydrates are all some of the amazing nutritional benefits associated with superfoods, but are not measured by ORAC, leading some to believe that the measurement does not show consumers an accurate depiction. “I believe consumers have a common misconception in understanding the ORAC value as it relates to all the different options in the consumption of nutritionally dense foods. Consumers should consider many different nuances in nutrition and incorporate variety to obtain the cornucopia of available phytonutrients,” says McMullin. Nutrients have varying bioavailabilities and often have specific therapeutic targets. Therefore, it seems, ORAC cannot be the determining factor for how “super” a fruit or grain really is. Shimazaki also notes that some products with high ORAC values may also contain large amounts of sugar, fats and calories. ORAC doesn’t easily translate past the superfruits category either; for example, in use with grains. There is general knowledge, says Gillot, that wild berries have many antioxidants, and therefore high ORAC values. So, in terms of marketing and packaging materials, chia’s ORAC value must be related to the values of berries (as in “chia seed has three times more antioxidants than blueberries”). The idea that the higher the ORAC value, the better the product, is bad for the long-term market because it causes manufacturers, retailers and consumers to focus only on an ORAC number and not other research. It is within these other types of research that the true potential benefits of these foods and products can be seen. For example, a 2009 double-blind, placebo-controlled, randomized human clinical pilot study published in the Nutrition Journal found a proprietary mangosteen juice (XanGo Juice) to lower markers of C-reactive protein in the body (a key marker of inflammation) and reduce body mass index for overweight study participants (3). I’ll have three million ORAC, please. It’s not uncommon to see a product label touting ORAC values reaching hundreds of thousands. This raises the question if a maximum number exists for effectiveness. For example, extremely high levels of certain nutrients simply cause the body to excrete the excess. Does the same logic apply to antioxidants? Açaí Roots: RTD beverages (juice and smoothies), frozen açaí pulp, organic freeze dried açaí powder, açaí liquid concentrate, açaí energy shots and açaí pills. American Health: Ester-C Advanced Antioxidant Formula. Core Naturals (Salba): Whole seed and milled Salba; raw oils; and Salba Life Whole Food Bars. Earth’s Bounty/Matrix Health Products: Superfood Gold. Functional Products Trading, S.A.: Grower of Benexia Chia products including Benexia Chia Seed, Benexia Chia Oil, Benexia Defatted Chia Flour and Benexia ALA Powder. Jarrow Formulas: PomeGreat Pomegranate Juice Concentrate, PomeGreat Pomegranate + Blackcurrant Red Grape Juice Concentrate, PomeGreat Pomegranate + Blood Orange Juice Concentrate, PomeGreat + Grape + Blueberry Juice Concentrate, PomeGreat PomeZotic, Blackcurrant Juice Concentrate, Blackcurrant Freeze-Dried Extract, PomGuard, Organic Berry High and Cran-Clearance. Kamut International: Supplier of Kamut brand grain. Nature’s Plus: A full line of supplements including açaí, goji, noni, mangosteen and pomegranate. Navitas Naturals: Organic chia, hemp and flax; açaí, maca, cacao, goldenberries, goji berries, mulberries, wakame, nori sheets, lucuma, camu, raw cashews and yacon; five varieties of Power Food Powder Twister Blends; three blends of Trail Power snack mixes; three varieties of Organic Superfood Chocolate Kits; and, the Sweet Tooth line of sweeteners (yacon syrup, organic green stevia and palm sugar). North American Herb and Spice: Bluebenol, Brambenol, Cherinol, Lingonol, Strawbenol, Pin Cherry Extract, Chag-o-Charge, Chag-o-Power, Lovely Larch Tea and Bet-u-Birch Tea. NOW Foods: A variety of products with açaí, goji, noni, mangosteen, pomegranate, maqui, raspberry, blueberry, blackberry, black cherry, cranberry, chia, quinoa, amaranth, spirulina, chlorella, alfalfa, flax and more. Pacific Grain and Foods: Premixed sodium-free pilaf blends with vermicelli added to rice or bulgur; dehydrated tropical fruit trail mixes; banana, sweet potato, cassava, and plantain chips; a large variety of rice, beans and flour; and puffed durum wheat. Proprietary Nutritionals, Inc. (PNI): Berry-Max line, Cran-Max. Sibu Beauty: Sea buckthorn liquid dietary supplement; 100% pure sea buckthorn seed and fruit oil gel-caps; topical creams, soap and treatment oil. Stiebs: Fruit-based juices, concentrates, purees, powders and extracts from pomegranate to prickly pear cactus. XanGo: XanGo Juice, Glimpse Topical Skin Nutrition, Mineral Treatment and the Juni Family Care line. Zola Açaí: Zola Açaí Juices and Zola Light Açaí Juices; Zola Açaí Superfruit Smoothies (Energy, Immunity, Antioxidant and Superfood blends) and, Zola Açaí Daily Wellness Shot. Exotic grains are certainly not new, but are making a resurgence in the market. Ironically, many of these are also referred to as ancient, or heritage grains, and are being thought of as new and innovative avenues toward health. Another benefit, Levin notes, is that grains and seeds offer vegan sources of omega-3 fatty acids and fiber. Bulking up your store. Retailers can make sure exotic grains are as accessible to shoppers as possible by setting up a great presentation. Crain says it is imperative that marketers and their retail partners provide educational materials, in-store demos, special promotions and coupons to get people to try products. GMOs. A lot of Americans are becoming aware of the influx of genetically modified organisms (GMOs) in the products they buy, but many are still unaware of how prevalent the problem is. Propster says, “Unfortunately, I don’t believe that most consumers are actually choosing, but instead are allowing the choosing to be done for them, due in part, to a lack of education. There are still quite a great deal of consumers that don’t even know what GMOs are and much less that realize the inherent dangers of them.” This raises the question of whether these GMO concerns extend past potatoes and corn to the exotic grains category. Many have pointed fingers at the agricultural giant and biotech firm Monsanto Company, headquartered in St. Louis, MO. Crain address the issue: “The GMO issue is primarily driven by Monsanto, and Monsanto is driven by profits and shareholders. Currently, there is not enough money and profits to be made from these other grains for Monsanto and other huge corporations to get involved with genetic issues associated with these other ‘new’ grains, perhaps with the exception of rice.” So, for now, it seems that many varieties of heritage crops, such as chia and quinoa, are safely out of the loop. 1. Mintel Press Release, “Mintel Predicts Flavor and Scent Trends for 2010,” Nov. 2009, www.mintel.com, accessed March 3, 2010. 2. Sensient Flavors Press Release, “Sensient Flavors Announces Top 10 Beverage Flavor Trend Profile Predictions,” Dec. 2009, www.sensientflavors.com/English/news/item/23/, accessed March 3, 2010. 3. J. Udani, et al., “Evaluation of Mangosteen Juice Blend on Biomarkers of Inflammation in Obese Subjects: A Pilot, Dose Finding Study,” Nutrition Journal 8:48, 2009.